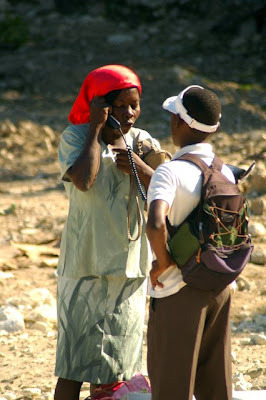 If you've not visited Haiti, this is one way you can use a phone. Land lines are almost non existent (and never work anyway) - but you can find a guy walking around with a cell and pay him a few gourdes to make a call. Hopefully you don't need privacy for your phone call. It is kind of like a roaming phone booth.